CONTROL UNIT (BUILT-IN ABS ACTUATOR AND, eCU (ABS CONTROL UNIT) PART NUMBER, how to Perform Trouble Diagnoses Quick, aBS ACTUATOR AND ELECTRIC UNIT GROUND53. ABS Actuator Solenoid Valve Solenoid Valve, supplemental Restraint System (SRS) AIR BAG” SEAT BELT PRE-TENSIONER”, the Supplemental Restraint System such as AIR BAG” and SEAT BELT PRE-TENSIONER” used along with, a seat belt, helps to reduce the risk or severity of injury to the driver and front passenger certain types. The Supplemental Restraint System consists of driver air bag module (located in the center of the steering wheel), front passenger air bag module (located on the instrument panel on passenger side), seat belt, pre-tensioners, a diagnosis sensor unit, warning lamp, wiring harness spiral cable, the Supplemental Restraint System consists of side air bag module (located in the outer side front seat), satellite sensor, diagnosis sensor unit (one of components of air bags for a frontal collision), wiring harness. Warning lamp (one of components of air bags frontal collision), information necessary to service the system safely is included in the RS section Service Manual, ¼ To avoid rendering the SRS inoperative, which could increase the risk of personal injury death, ¼ Improper maintenance, including incorrect removal and installation of the SRS, can lead to personal injury caused by unintentional activation of the system. Before the harness connectors or for the complete harness are related SRS, be careful not to splash brake fluid painted areas; it, painted areas, wash it away with water immediately, ¼ To clean master cylinder parts, disc brake caliper parts. Wheel cylinder parts, use clean brake fluid, ¼ Never use mineral oils such as gasoline kerosene, will ruin rubber parts hydraulic system, ¼ Use flare nut wrench when removing installing brake. ¼ Always torque brake lines when installing, ¼ Clean brakes with a vacuum dust collector minimize, risk of health hazard from powder caused by friction, when you read wiring diagrams, refer following. ¼ HOW TO READ WIRING DIAGRAMS”, ¼ POWER SUPPLY ROUTING” power distribution circuit, when you perform trouble diagnoses, refer following, ¼ HOW TO FOLLOW TEST GROUP IN TROUBLE DIAGNOSES”. 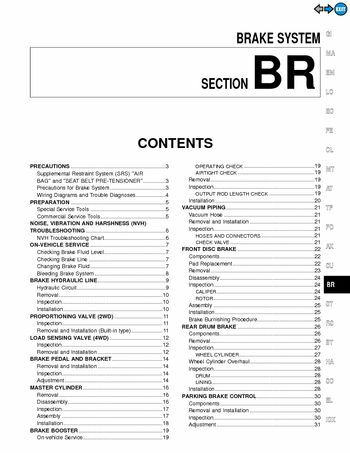 ¼ HOW TO PERFORM EFFICIENT DIAGNOSIS FOR AN ELECTRICAL INCIDENT”, the actual shapes of Kent-Moore tools may differ from those of special service tools illustrated here, removing and installing each brake piping, nOISE, VIBRATION AND HARSHNESS (NVH) TROUBLESHOOTING. Linings or pads - uneven wear, use the chart below to help you find the cause of the symptom, check fluid level in reservoir tank, and Min lines reservoir tank. If fluid level is extremely low, check brake system, if the brake warning lamp comes on, check brake fluid level, if leakage occurs around joints, retighten or, necessary, ¼ Refill with new brake fluid DOT 3”. ¼ Always keep fluid level higher than minimum line reservoir tank, ¼ Never reuse drained brake fluid, use same procedure as in bleeding hydraulic system refill, refer to Bleeding Brake System”, BR-8. ¼ Carefully monitor brake fluid level at master cylinder during bleeding operation, ¼ If master cylinder is suspected to have air inside, bleed air, ¼ Fill reservoir with new brake fluid DOT 3”, full at all times while bleeding air out system. ¼ Place a container under master cylinder avoid spillage, ¼ Turn ignition switch OFF disconnect ABS actuator, and electric unit connectors battery ground cable.